The Ultimate Sticky Notes Application! With SuperNotes, you can encrypt each individual note. Have you ever allowed someone to borrow your laptop, or has someone glanced over your shoulder and watched what you were doing on your computer? With SuperNotes, your personal notes can be secured with very strong, industry standard encryption algorithms. In place of the regular text on each encrypted note is a “thumb print” watermarked over the encrypted text, signifying that the particular note is for your eyes only. Only you can decrypt the note when you want to once again read the text. Each note can be encrypted with its own individual password, or you can use a Global password to encrypt ALL notes. It is safe, extremely secure and never again will anyone view your private data without your authorization. Backup and Restore of all desktop SuperNotes. You can use these backup files to transport SuperNotes from one computer to another, or simply save selected notes for archiving. Several custom desktop themes to choose from, including the standard “cork” backdrop. 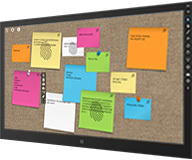 LiveTiles – Each SuperNote can be turned into a LiveTile, appearing on your desktop and updated with custom colors and the message of the note itself (unless encrypted). Sharing – you can Share SuperNotes with OneNote, email or any other “shareable” application installed on your computer. Encrypt or Decrypt ALL notes with a single button. Immediately makes your entire Note desktop secure with your password. SuperNotes is more than another ordinary Sticky Note application. These unique features make it a powerful, and secure, productivity tool.